EverLast™ Basement Windows are energy-efficient, vinyl-framed replacement windows. Designed with double-paned, low-E glass, they are much more energy efficient than the single-paned, steel-framed windows that are the industry standard. Designed to replace your rotting, outdated steel and wood-framed basement windows, our windows will never rot, rust, decay or need paint. The double-paned windows can be removed easily for cleaning and maintenance. SunHouse™ Window Well Enclosures are covered window wells -- the perfect thing to replace your corroded, debris-filled metal wells. A clear cover and brightly colored sides and bottom maximize the sunlight directed into your basement for a brighter, more attractive space. Meanwhile, the plastic cover keeps out dirt and debris, while protecting your basement windows from being buffeted by winter wind. EverLast™ Basement Windows will generally take an installer 1 - 2 hours to install, while installing each SunHouse™ Window Well should take 1 ½ - 2 hours. The purpose of basement windows is to add appeal to your space by bringing in natural sunlight. If those windows are rusted, covered in debris, or doing little more than affording a view of an old, rusty window well, then they're not doing their job. Meanwhile, old window wells often fill with leaves, dirt, and weeds, and they can fill with snow and water, which may leak into your basement. With a typical basement waterproofing, this water will still leak into your home (we have solutions for this kind of problem). The answer to these problems is EverLast™ Basement Windows and SunHouse™ Window Wells. These dry basement products will not decay when exposed to the elements, and they maximize the beauty of the basement space. Covered window wells keep cold winter winds from blowing against the panes, while the Low-E double thermopaned glass of EverLast™ Basement Windows saves you on your energy bills. It's a small upgrade that can really make a big difference for your home! 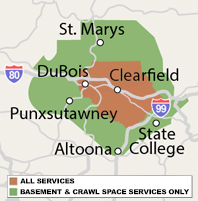 We service Clearfield, Reynoldsville, Brookville, Curwensville, Punxsutawney, Philipsburg and many nearby areas in Pennsylvania.